Generally, some follow the “rule of thumb” where half of a film’s production budget will be additionally allocated to marketing (if a film is $100 million, an additional $50 million will be spent on marketing totaling $150 million). However, this is misleading because when it comes down to building awareness and excitement, a film’s the marketing budget is uniquely tailored to the needs or goals of the film. In one case, The Hangover II’s marketing spend exceeded the production budget by roughly $5,000 or 133% of the production, while on the other hand, Pirates of the Carribean: At Worlds End had a marketing budget at 12% of the $300 million production. Tomato, tomato… right? Photo credit: Ocean Media Inc. Thanks to Ocean Media Inc, we have this great infograph to compare summer sequel production and marketing budgets to their respective rating and earnings. Pay attention to the amount of spending on each brand, and the fluctuating returns and criticism on each movie. My favorite part, though, is the typical breakdown of film’s marketing budget. Indeed, it’s not how much you spend but how you spend it…BUT… I want to add an additional thought to this saying. It’s not how much you spend, but how you spend it and what you get in return. ROA is a big deal in business; Return on Assets gives an idea as to how efficient management is at using its assets to generate earnings. What does this have to do with marketing? Efficiency. We know that Hollywood is spending big money to market its films… so how can efficiency be measured? Return on Advertising (or Return on Advertising Spend known to digital marketers) aims to measure efficiency of how film marketing budgets are spent. Whether advertisements are placed on TV, billboards, magazines, or online, the big question is, “How do we know these advertisements are driving purchases?” Do online ads encourage ticket sales more than TV commercials? Do additions to the traditional rectangular billboards that create a 3D or “out-of-the-box” effect drive greater theater attendance? Which trailers excite target markets more, teaser or revealing story-line trailers? Numerical analysis is the only way to answer any of these questions and unfortunately measurements are rare because in some ways, it’s impossible. Call it wishful thinking, but we’ve determined a few solutions that entertainment marketers can use to measure ROA. Remember that there is no standard approach to marketing a film, so think of how you can plug in these mathematical cheats into your movie’s ROA formula. SacnLife is optimistic of the QR trend, reporting, “QR Code trends continue to gain momentum as smartphone owners grow across the globe, and smart marketers turn to engage marketing to reach mobile consumers.” Additionally, QR marketing has achieved a 2% advantage over direct mail marketing when it comes to response rates. The take home here is that QR codes can be placed on various print ads to direct consumers to a ticket purchase landing page. Web analytics can then report the efficiency of the QR’d advertisement based on web traffic, click-through rates, and conversion rates. Additionally, QR codes can be differentiated based on location or media source to cross-reference and analyze the efficiency of a campaign based on a specific geographic area or target market. QR marketing sounds great in theory, but it needs one more feature to make it work: incentives. My personal research has found that QR scanning is actually an inconvenience for some smartphone users. The reason? – it takes too damn long to access and even longer to scan. Therefore, to battle this flaw in the system and really utilize QR marketing, incentives (such as discounted ticket rates or additional content or “giveaways” to name a few) must be part of the deal to justify the inconvenience on the consumer. Distributors can’t go off giving all their revenues away and back to the public, though… designing incentives require expertise to balance money spent with money made, in favor of the later of course. Google might be onto something, as well. Our friends at Google Inc. are out to measure ROA themselves. Acording to Business Insider, “in 2011, Google was granted a patent for a ‘head mounted gaze tracking device’ that ‘comprises eyeglasses’ that would charge advertisers for the number of times users looked at their ads both online and in the real world, including billboards and magazines.” Fast forward to millions of people sporting the Google Glass, this gaze tracking technology can track a person’s perception to an advertisement (identified by something like an automatic QR scan) and the successful purchase of a ticket and viewing of a film. So TV is great and all, but the reason a majority (40-50%) of marketing budgets are spent on TV advertising is because it’s that expensive. Despite the costs, it’s one of the greatest ways of enhancing awareness and provides additional opportunities of limiting the message to networks, time-frames, and regions aligned with a film’s target market or distribution strategy. However, there’s shift in at-home entertainment consumption that’s causing people to “cut the cord” – meaning, households are canceling their TV subscription because of rising costs and viewing benefits of “digital TV” like HuluPlus or Netflix . There’s also a consensus that people avoid commercials. So why waste money on TV advertising if no one is watching it anymore? ROA says to shift those resources to new media, like social media and digital outlets. Despite reduced costs, going digital also provides marketers numbers. Linking social media to movie websites, web traffic can be regressed against teaser and trailer releases (as well as additional content) to measure tracking (awareness). If incentives are provided along the release plan of marketing materials, pre-sale tickets for release weekend can provide ROA for teaser efficiency against trailer or other media. Videogram converts video into an interactive pictorial summary giving a user multiple entry points and allowing video to be browsed and discovered with the same simplicity as photos. Videogram empowers consumers to share and comment on the clips/sub-clips that they find the most interesting, driving higher virality on the content. As Videogram knows what parts of the video are receiving the most engagement―down to the frame level―we provide content publishers and brands with a VISUAL summary of exactly what is happening within their content. Because Videogram knows what parts in a video are the most popular and trending at any given point in time, pre-roll can be dynamically placed in front of any particular trending frame. As these rich media ads are within the video and are a completely new and immersive ad unit, the CPM is much higher than traditional impression or banner advertisements. By giving consumers the power to share what they want to share, marketers can measure trends within their advertisements to either expand current campaigns or build new campaigns based on those interests. 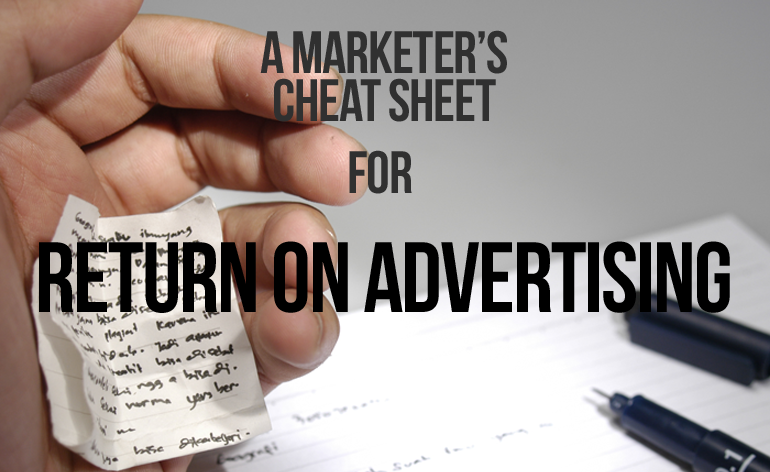 Are you using these cheats to use your marketing budget efficiently? Congratulations, A+ for you! But I’m sure you know, Return on Advertising isn’t a requirement; instead it’s encouragement. With the risks of high investment in not just a production, but also a marketing plan, studios should seek to optimize the use of their overall resources. With these three cheats, marketers are encouraged to find numbers that measure their performance. As developing technologies are increasing the capabilities for marketers to measure performance, perhaps a shift in advertising placements will increase the percentage of marketing budgets spent on digital and social media and lower the costly expenses of un-engaging print materials… I’m no fortuneteller though, just a marketer who’s careful about money. Pitch in: What additional “boosters” can you add to the ROA cheat sheet?